Our boldest and most dynamic Windows Media Player 11 / 10 skin to date! Alienware Invader features a 580+ frame stunning intro animation, sound fx created by our friends over at SoundRangers and a design that is simply "out of this world." The Skins Factory once again raises the bar on skinning and User Interface design. 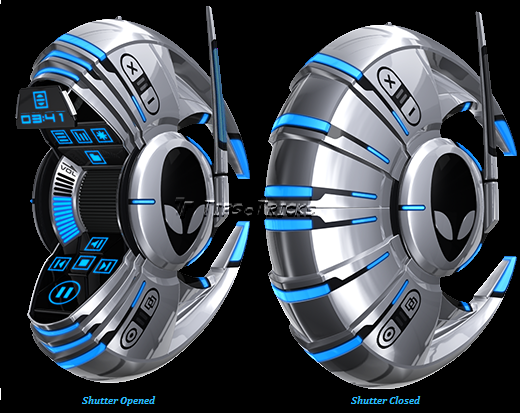 Part of the Alienware Invader Desktop Skin Suite. Alienware Invader is distributed on all new Alienware PCs and can be downloaded by the public for free. You must have Windows XP and Windows Media Player 11 / 10. Edited by Tech*Wiz, 01 September 2005 - 04:02 AM. Thanks TSF. Thanks for the one of the best WMP skins! one of the best WMP skin i've seen.